A new CBPN ebook is underway - 'Enterprise Digital'. Enterprise CIO’s face a bewildering landscape of emergent new technologies, and while there is a clear imperative to embrace them, how to factor them into the complexity of their existing estate is a steep challenge. ‘Enterprise Digital’ is a term to encapsulate this challenge and the definition of an architecture and technology stack that addresses it. five key service layers – engagement, integration, development, data, and core IT – it integrates enterprise applications, makes data accessible, and easily connects with ecosystems and users. This is the key strategic dynamic – An enterprise technology purposely intended for implementing Platform Business Models, no longer thinking in terms of linear supply chains but instead of enabling and orchestrating multi-dimensional digital ecosystems. Core IT is not a ‘separate’ environment – rather the applications are brought to the center of the integrated ‘Enterprise Digital Platform’. “data layer” – a data discovery environment with great analytical capabilities designed to extract business value and meaning. On the “development layer”, IT-professionals can continuously deliver new digital products and services. The “integration layer” uses services and APIs to connect the internal and external ecosystems. Finally, on the ”engagement layer“ the users have frontends that connect them to this ecosystem, allowing a whole new customer-centric, immersive experience. 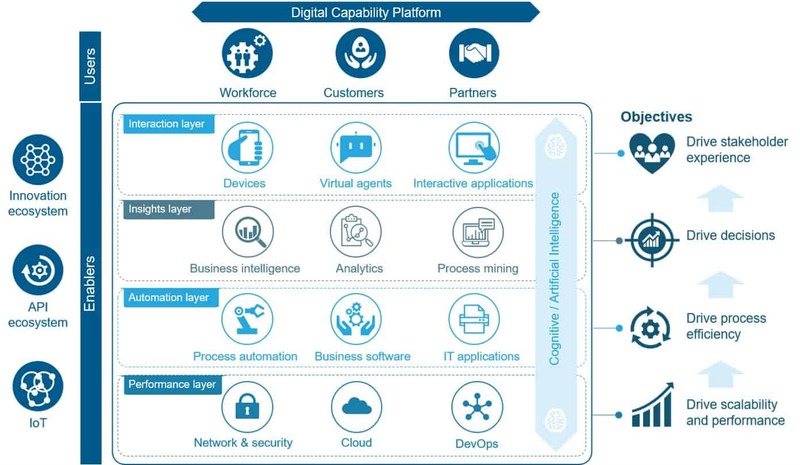 The role of the Enterprise Digital Platform is a singular environment for uniting all of these component parts into a manageable environment for large organizations. A fundamental characteristic is elevating the enterprise to operate in real-time, providing instant responsiveness to customers across multiple channels, and defining the context for key developments such as AI and chatbots. For example Forrester are reporting on ‘RTIM’ – Real Time Interaction Management, what captures the essence of the evolution of CRM to CXM – Customer Experience Management, a major capability within the overall suite that itself breaks down into next-best experience, cross-channel marketing, personalization, cross-channel communications, and loyalty marketing, and populated by vendors like Adobe, Certona, Emarsys, FICO, IBM, Infor, Kitewheel, and Pegasystems. As Forrester describe these are technologies closely aligned with and intended to enable the enterprise to envision and design multiple customer journeys, intelligently adapting to their context and preferences and presenting them with the the right digital engagement at the right time. At their recent Edinburgh Customer Summit Pegasystems showcased a number of clients active with this new paradigm. Paul de Laat, Customer Data & Insight Director at Centrica, described how they transformed their customer experience, one that previously left customers feeling undervalued and underwhelmed, a ‘transaction only’ experience. With their shift to Smart Meters the volume of data they have to deal with has also expanded exponentially. Through a Pegasystems-based Enterprise Digital Platform, they built a solution that leveraged an SAP Hadoop Data Lake to define an Insights Data Model, knowledge about each customer that enabled them to automatically generate personalized Campaign Offers, presented to them via a ‘Customer Choice Hub’. Each customer was offered incentives they would find most valuable, pulled from a library of different templates and triggered upon key events. Pegasystems provided them the tools to create these personalized campaigns, using Product Roadmapping techniques to plan these new customer journeys and extend them across multiple channels including email, mobile, inbound and outbound telephony, and consequently halved their churn rates and increased digital engagement by 13%. 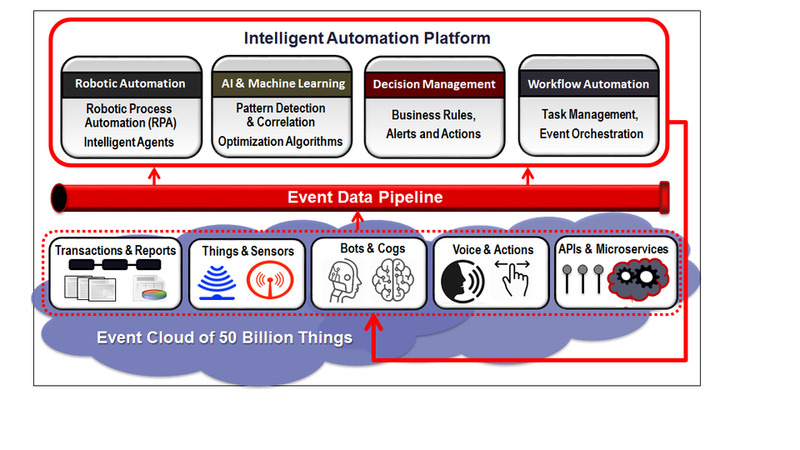 Provisioning these types of experiences can be seen as the first use cases for the general adoption of AI in the Enterprise. Google reports on how more than half of organizations polled say their businesses are using statistical machine learning (63 percent), robotic process automation (59 percent), or natural language processing and generation (53 percent). Just under half (49 percent) are still using expert or rule-based systems, and 34 percent are using deep learning. Writing on Forbes.com Nathaniel Palmer describes this as an overall trend of Intelligent Automation, with RPA being one of it’s four essential pillars. Nathaniel highlights how RPA offers the tools for achieving low hanging fruit quick win applications of AI. In short anywhere and everywhere humans are used to conduct repetitive IT tasks is fertile ground for RPA. And in any large enterprise these scenarios are myriad. Despite the adoption of large scale application systems lots of office work is still achieved through Excel spreadsheets and Word documents completed manually and emailed between colleagues. Any process relying on this type of manual effort is a drag on the overall process performance and on the productivity of each person doing it, the type of automation IT was always intended for and scenarios that RPA is particularly adept at addressing. Sarah Burnett of the Everest Group provides insightful commentary about the integration aspect of RPA, suggesting that the immediacy of ‘surface level’ integrations will face a brittleness due to changes in the target application and ultimately we’ll see API-based approaches offer more robust solutions. The modular nature of the EDP highlights the potential role of Cloud providers like AWS and Azure. Again enterprise organizations will be presented with a ‘Buy vs Build’ choice, with vendors like SAP offering a complete single suite, and Cloud providers offering the equivalent functionality via their vast range of PaaS capabilities. A great case study of this approach is shared via Bernie Gracy, Chief Digital Officer for Agero, presenting at the AWS 2018 summit. Beginning at 17m:15s, he walks through a detailed case study presentation of how they have embraced AWS to achieve this same type of transformation. Also motivated to achieve a shift to a Platform Business Model, Agero embraced an in-house development approach and the Agile DevOps model common to modern day Cloud implementations. At 18m:20s Bernie describes that Agero is a classic multi-sided platform, matchmaking the demand for roadside assistance coming from many ecosystem customers such as insurance providers, with thousands of independent towing companies. At 20m:20s Bernie describes this threat as a need to ‘Go Digital or Go Home’, how they have responded to the challenge through wholesale transformation of the role of technology in their organization, encouraging and enabling a culture where ‘every one is an innovator’, seeing the world through a new lens of new capabilities and thus a new possible. In particular he disputes the analysts ideal of ‘bi-modal IT’, where legacy systems are treated as untouchable black boxes and innovation is focused on a new tier of separated applications. Instead they decomposed their 15 year old monolith application previously dedicated to call centre agents, into 200 microservices that could be orchestrated by any facet of their new platform. They expanded new digital capabilities across their value ecosystem, creating a new app for crash detection that over 300,000 customers downloaded and used, optimizing their algorithms. This was built using Lamda Serverless technologies, enabling them to focus on the value generating business logic and the use of Machine Learning to build a smart app, with AWS handling the underlying, non-value adding infrastructure elements. It also included transforming the customer experience, such as the use of telematics to enable roadside assistance built directly into the car itself as well as a range of mobile app innovations that are made possible through the exposure of their API to partners like insurance providers, for which they won the award of Omnichannel Application of the Year. The Enterprise IT landscape evolves through major eras of change – From the first Data Processing Centres, through PC Client Server, Internet and Cloud, and now that we are well into the era of Platform Economy, we’re now witnessing this scale of evolution. Enterprise Digital Platforms will become the umbrella concept and model that defines how vendors and CIOs go about pioneering its adoption.